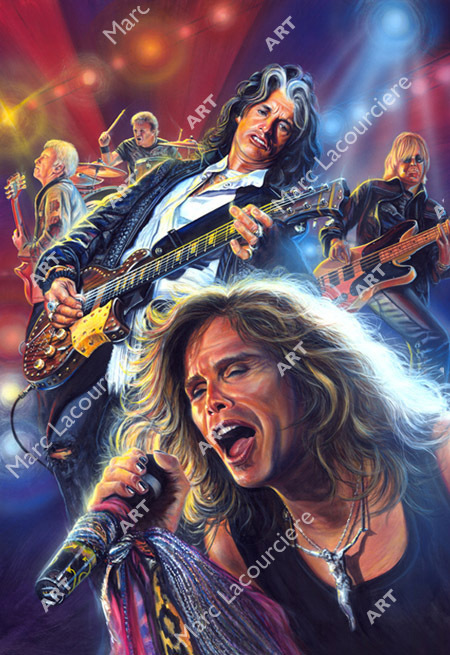 Aerosmith is a prominent American rock band. Their high level of energy when they perform on stage, is what I wanted to portray in this painting. The use of brilliant colors and glowing lights, brings this painting to life and is one of my personal favorites. The band enjoyed major popularity throughout the 1970’s, with their rock anthem sounds. Putting past problems behind them, the band went on to enjoy resurgence in popularity in recent years, and has made them one of top-selling and most popular rock bands in the world today.